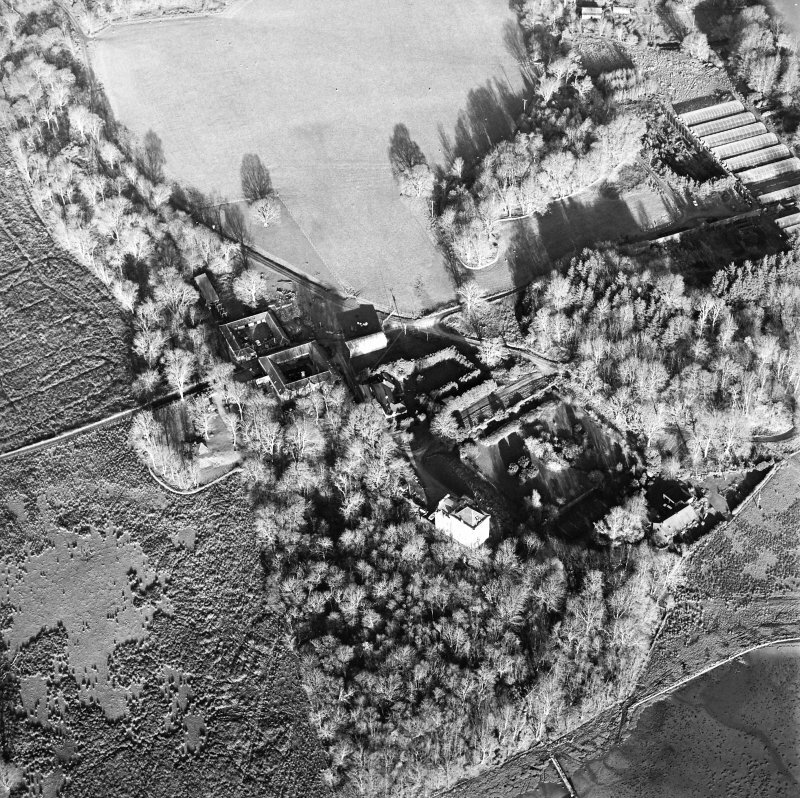 Oblique aerial view centred on the farmstead with the castle adjacent, taken from the N.
Oblique aerial view centred on the castle and the farmstead, taken from the SSW. 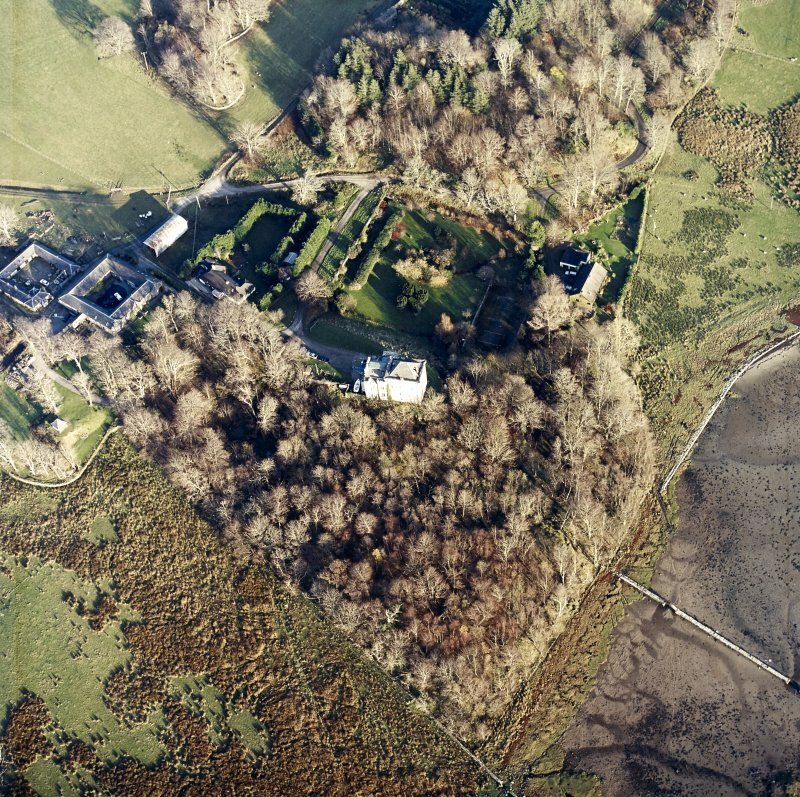 Oblique aerial view centred on the castle and the farmstead, taken from the N.
Craignish Castle. 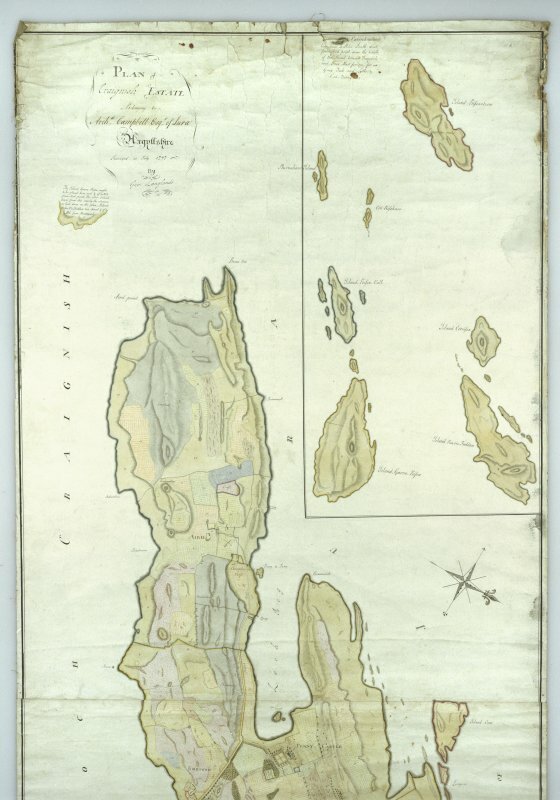 Digital copy of both halves of plan of estate by George Langlands. 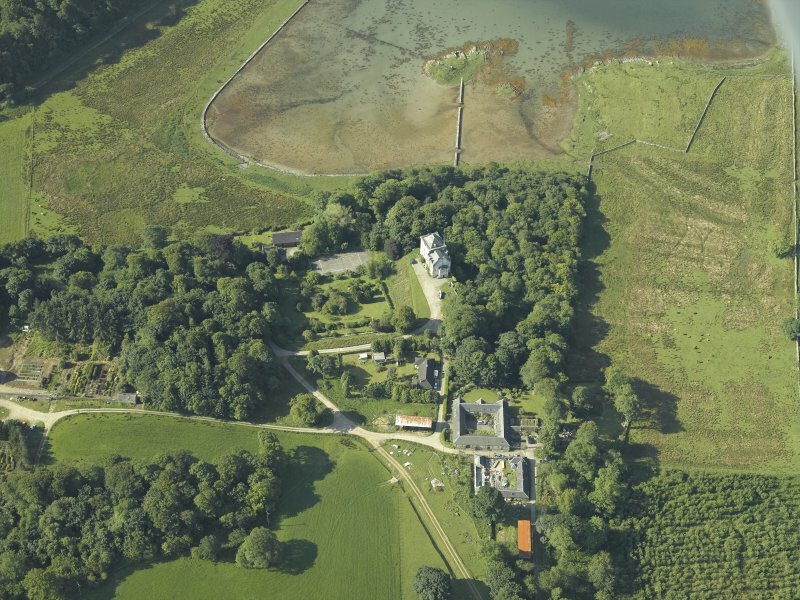 Oblique aerial view centred on the castle and the farmstead, taken from the WNW. 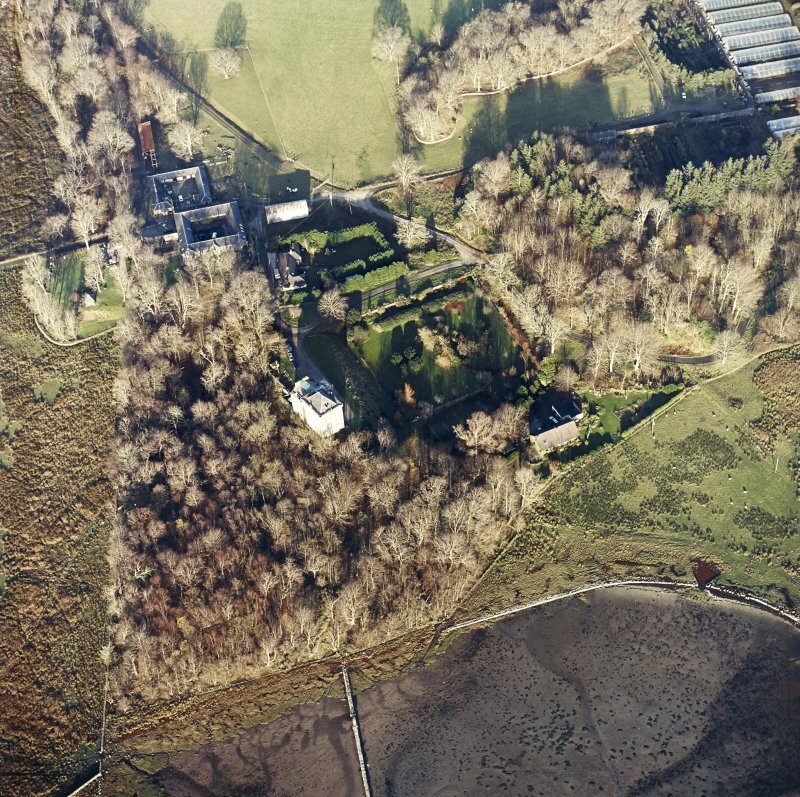 Oblique aerial view centred on the castle and the farmstead, taken from the E.
Craignish Castle. 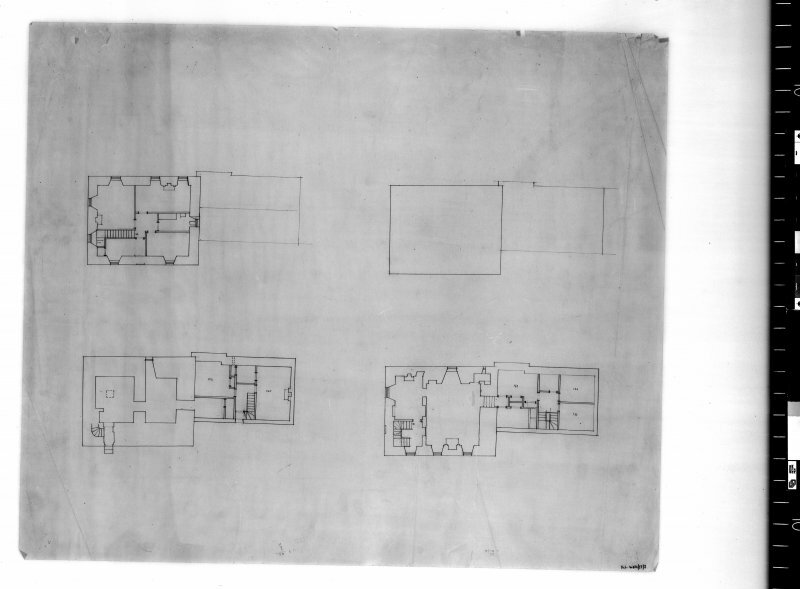 Photographic copy of upper half of plan of estate by George Langlands. 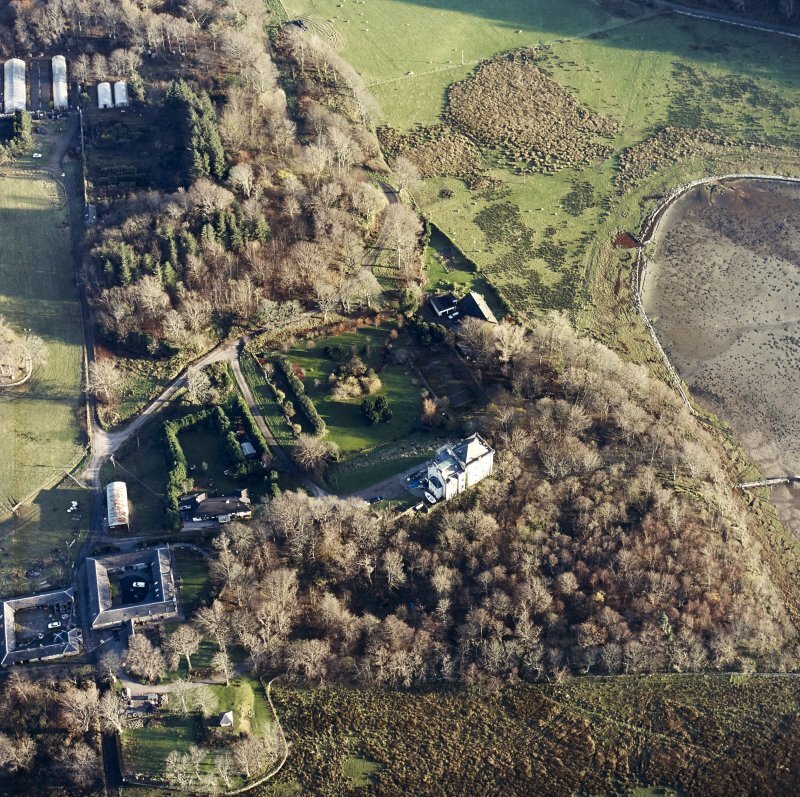 Oblique aerial view centred on the farmstead with the castle adjacent, taken from the W.
Oblique aerial view centred on the castle and the farmstead, taken from the SW.
Oblique aerial view centred on the castle and the farmstead, taken from the NW. 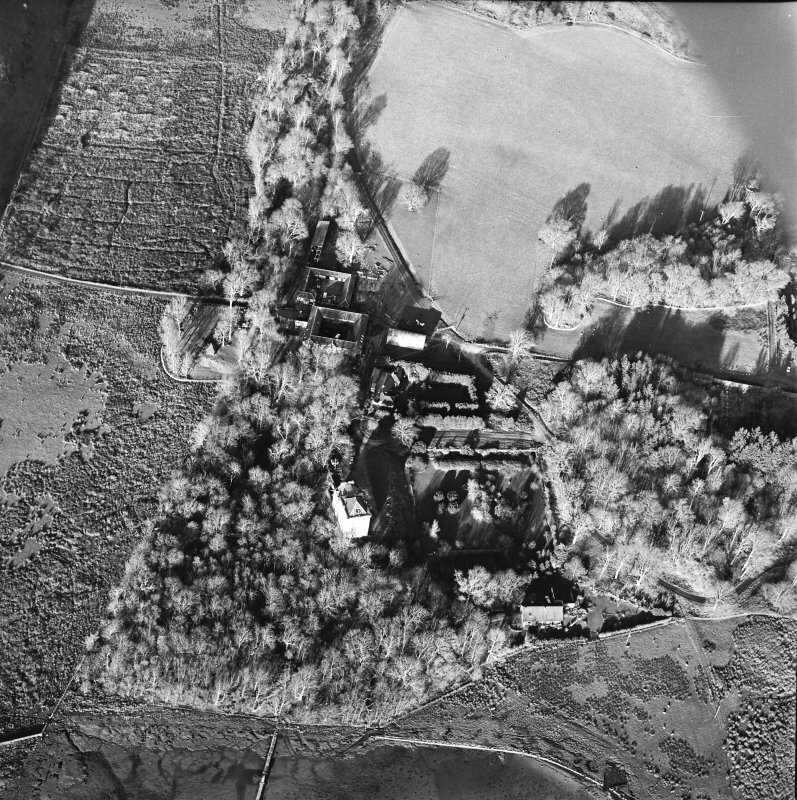 Oblique aerial view centred on the castle and the farmstead, taken from the WSW. 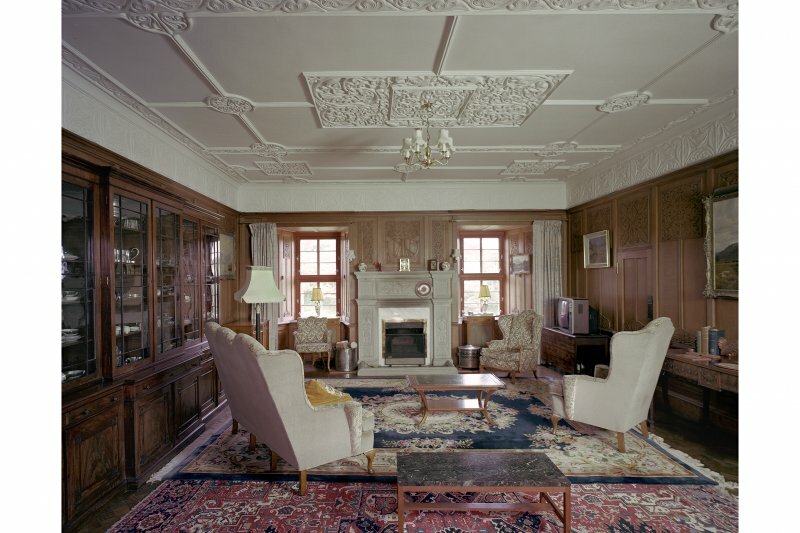 Craignish Castle. General view from South-East. 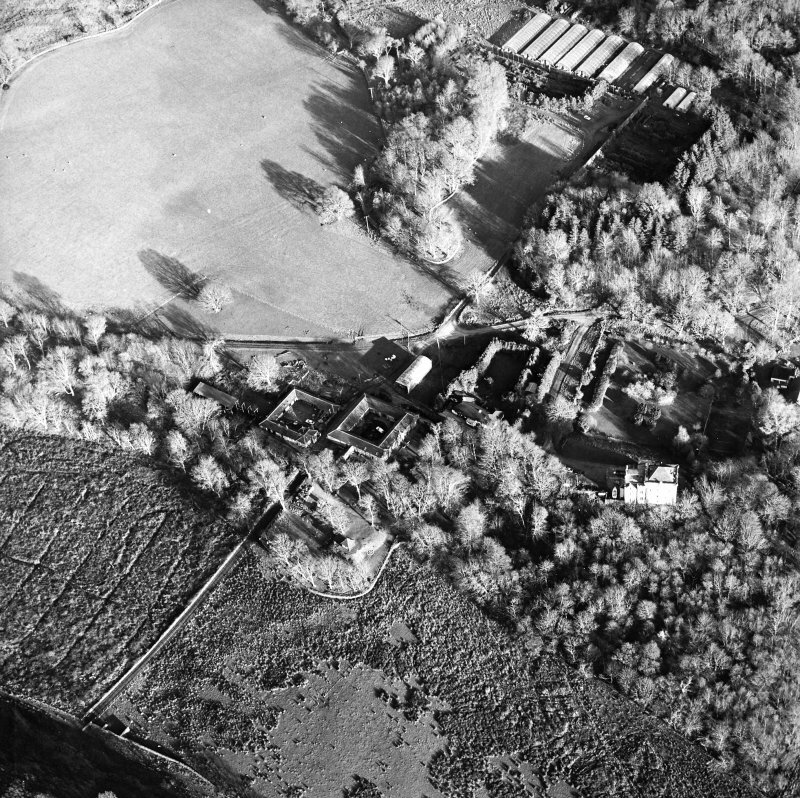 Oblique aerial view centred on the castle and the farmstead, taken from the NNE. 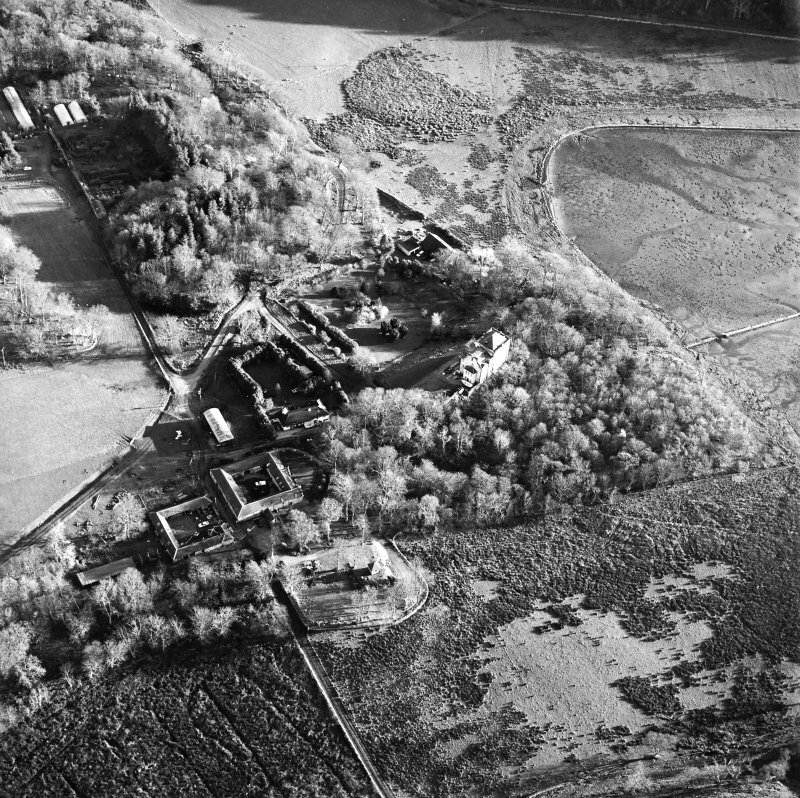 Oblique aerial view centred on the castle and the farmstead, taken from the ENE. 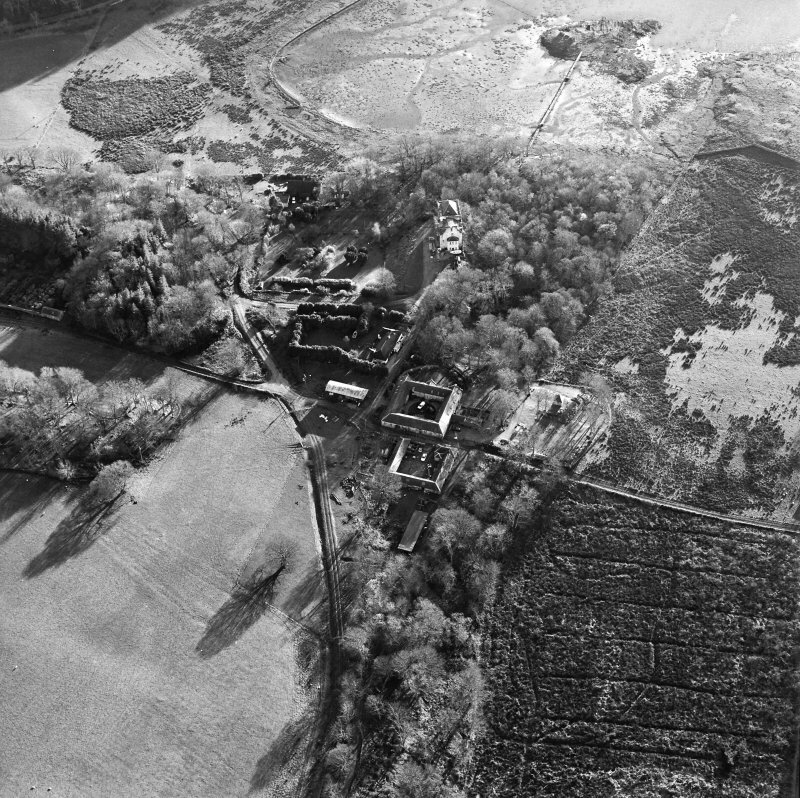 Oblique aerial view centred on the castle and the farmstead, taken from the NE. 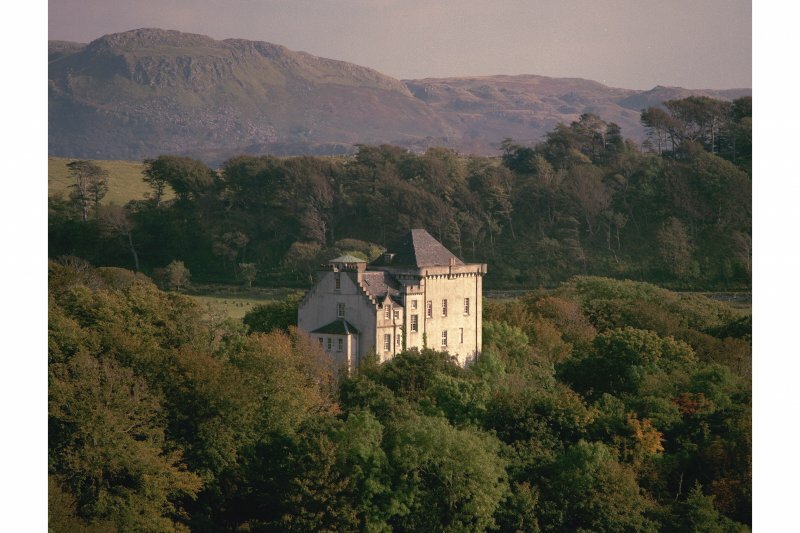 Craignish Castle. 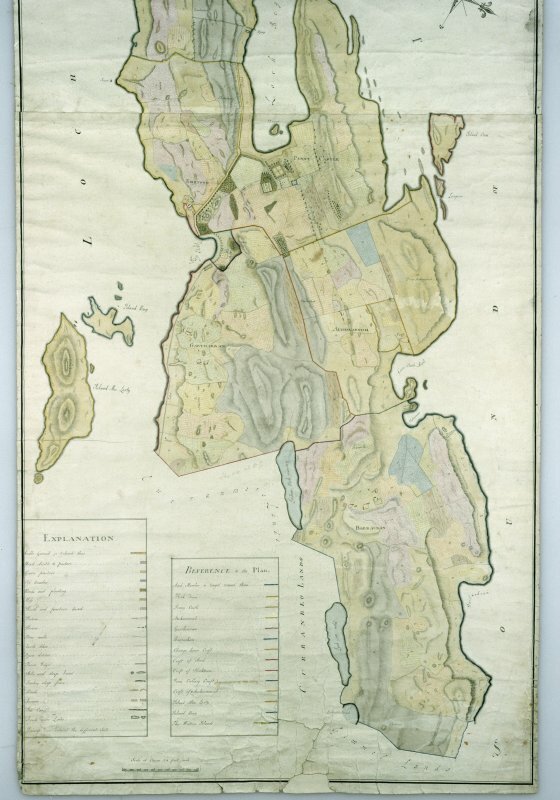 Digital copy of lower half of plan of estate by George Langlands. 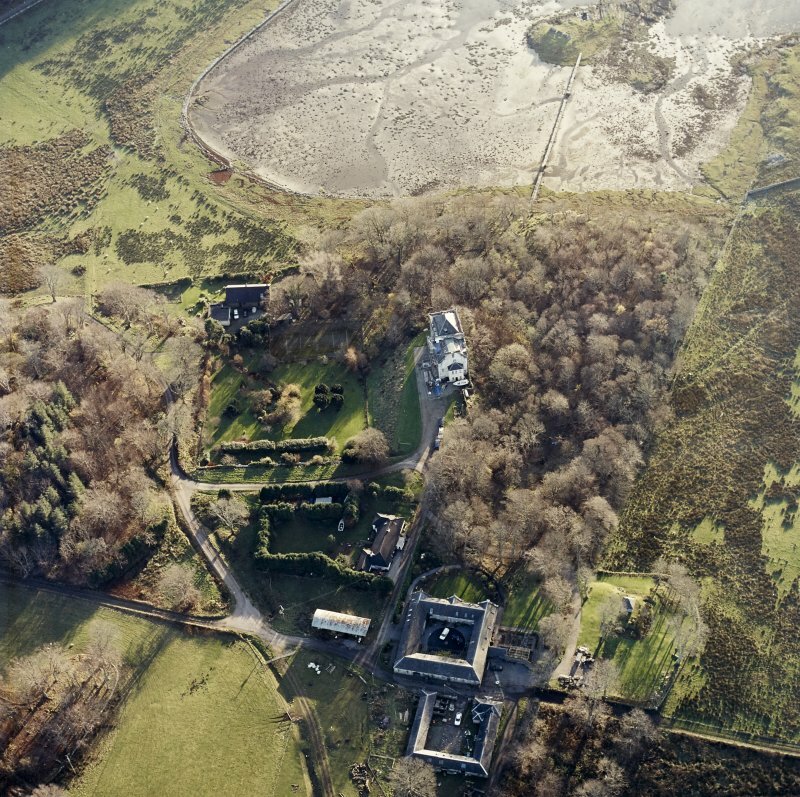 Craignish Castle was originally a simple 16th century keep, 41'9" x 33'6", with walls 7'6" thick, which has been much altered and forms part of a modern mansion, standing on a detached rock. The ground floor of the keep is vaulted, and there is a dungeon below, cut out of rock. 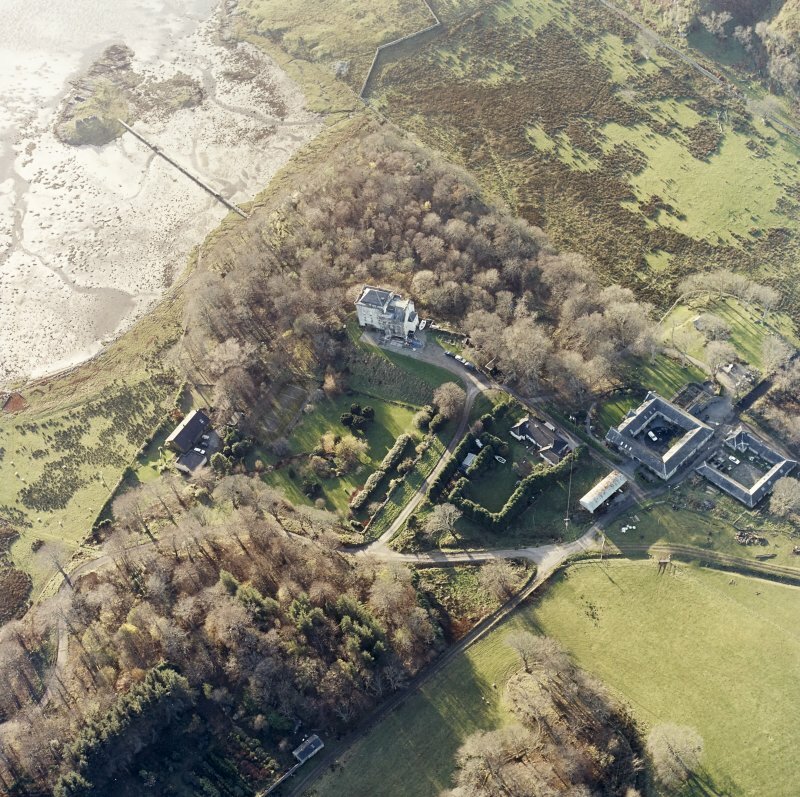 The mansion, recently restored (SDD 1960-) is 3 storeys high, with harled walls; an addition to the N, originally a long wing, now reduced, was made c. 1835. 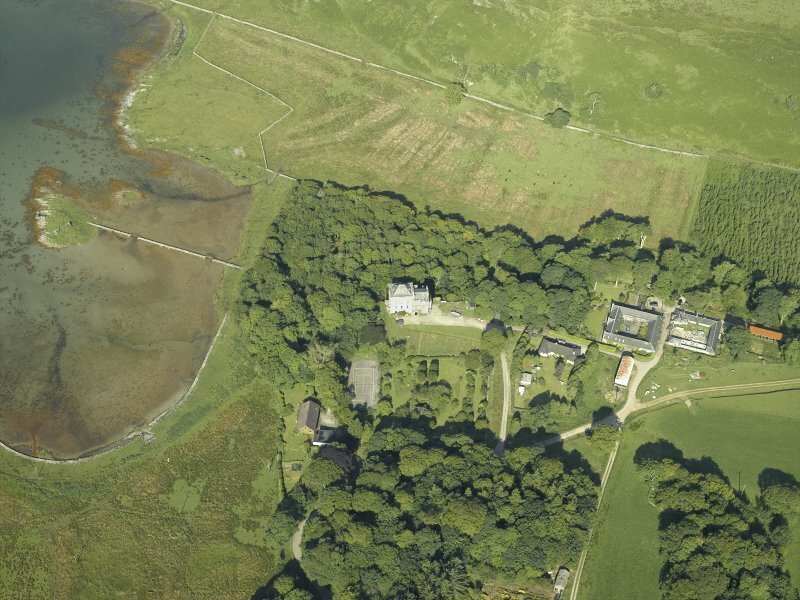 The SDD (1960-) note a rubble rampart to E.
Now completely harled, Craignish Castle (name confirmed) exhibits little of architectural interest. There is no trace of the rubble rampart. Visited by OS (JP) 14 October 1971. 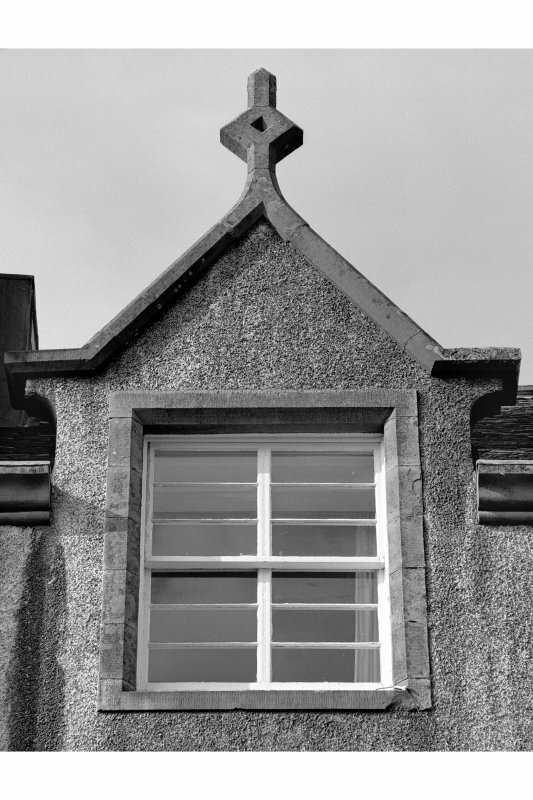 ARCHITECT: William Burn, alterations 1837 ('Mr David Bryce', pp. 118-119). I. G. Lindsay Collection, W/263. 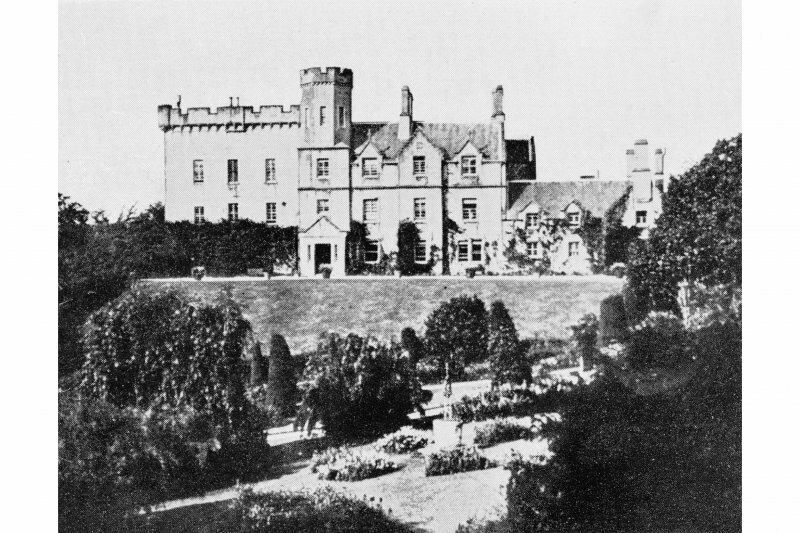 A drawing by Andrew Elliot of the Castle, the seat of Colin Campbell of Jura. 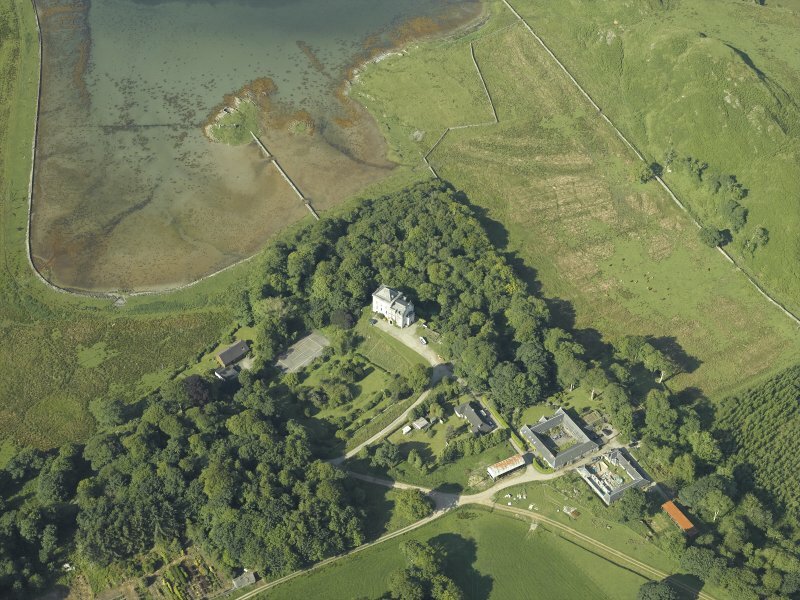 The much-altered and extended remains of this late medieval tower-house stand on a level tongue of land overlooking the head of Loch Beag, an inlet of the Sound of Jura about 3kmfrom the SW end of the Craignish peninsula. 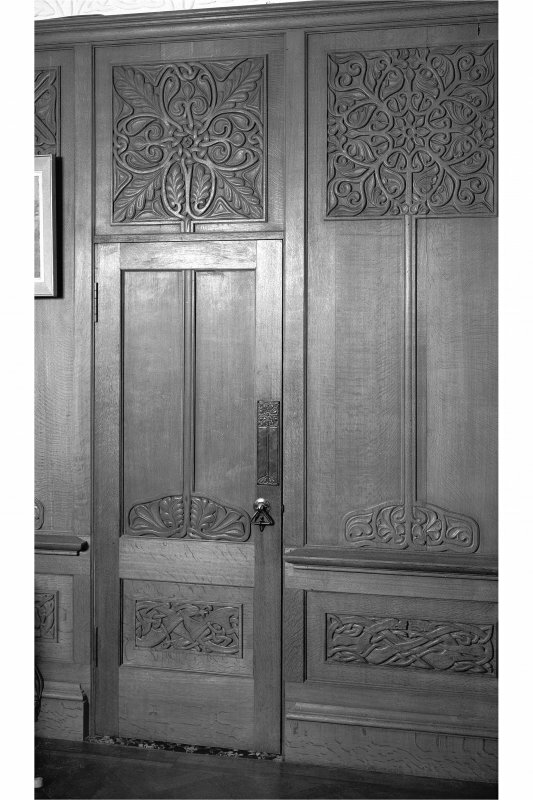 In its existing form it comprises work of three main periods, together with at least two phases of alterations in the 20th century. 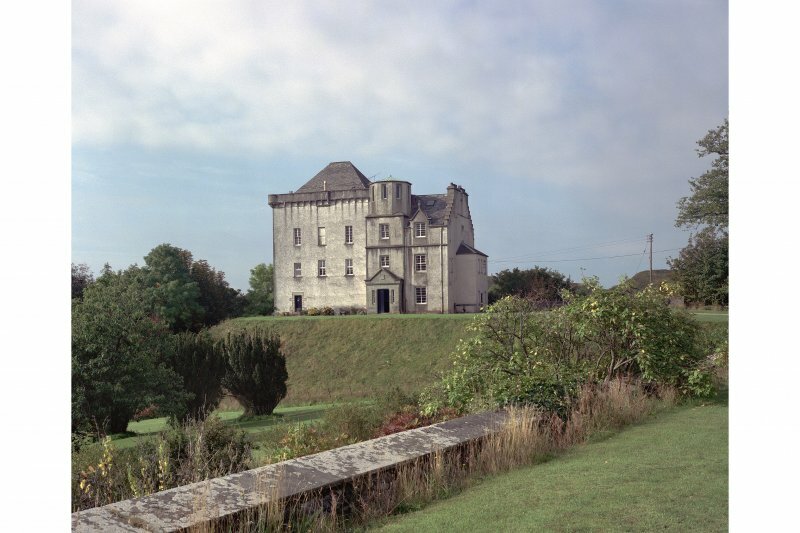 The ground floor and part of the first floor of the three-storeyed tower-house occupying the S part of the site appear to represent work of late 14th- or early 15th-century date, the castle being recorded as incomplete in 1414. The remaining walls of the tower were subsequently reconstructed and the interior remodelled at some date in the 16th or 17th century, judging by a few surviving architectural features. 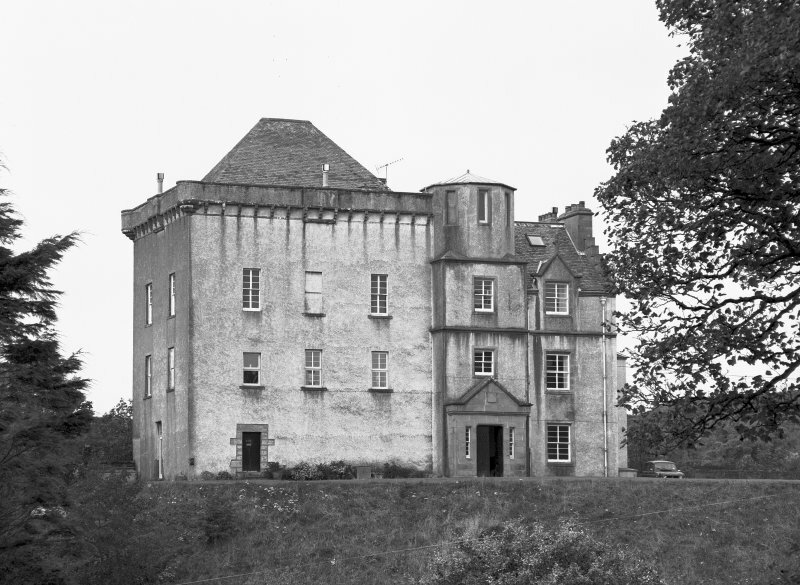 A two-stage N range, in existence in 1797 (en.1), was added to the tower, but in 1837 these additions were replaced by two- and three-storeyed ranges in English Elizabethan style designed by William Burn (en.2), and the upper works of the tower were rebuilt at the same time. 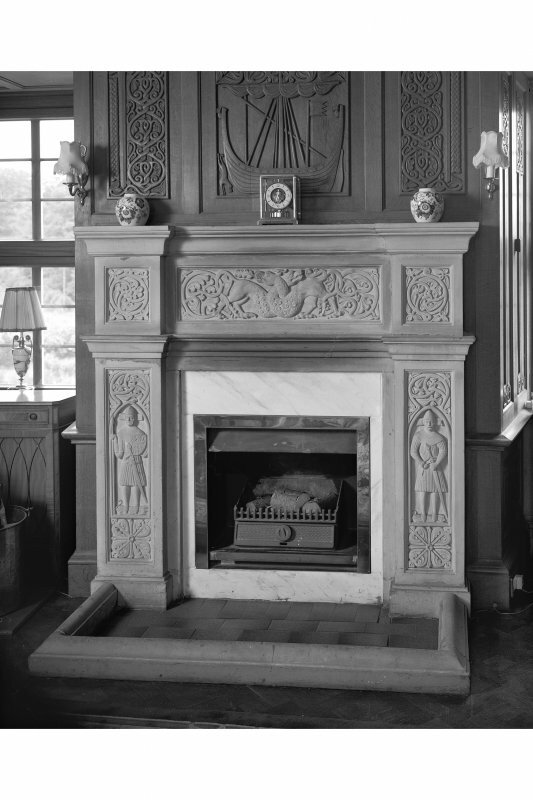 These additions have since been reduced to two of the original four bays of the three-storeyed N range, a two-storeyed stair-wing being added against the centre of the new N gable-wall, which was an original internal flue-bearing wall. 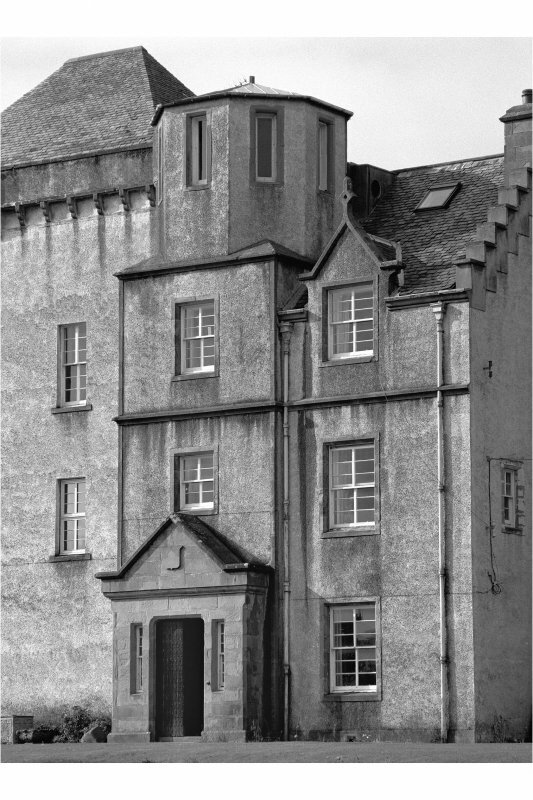 The crenellated octagonal upper storey of the 1837entrance-tower has also been reduced in height, while the tower-house itself is now covered with a high hipped roof.